Northern Rhodesia 1953-1955 Q.EII 1/2d to 1 shillings 9v Mint Stamps. Northern Rhodesia: 1948 Silver Wedding 1½d & 20/- SG 48 & 49 fine unmounted mint with clear gum (see scan 2). £110.30 (SG 'Part 1' 2019). I have acquired a comprehensive GEOVI fine mint accumulation of most countries. Most are very lightly mounted mint and very fresh. Brilliant, Just as described, Great communication, Would buy again. NORTHERN RHODESIA King George V 1925 to 1929. The Giraffe & Elephant Set to 10 Shillings (ex 3/- & 7/6d.). From the range SG 1 to SG 16. MINT Very Lightly Hinged - Full Original Gum. Add to Favourites. 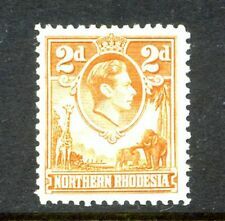 SG 25-45 Northern Rhodesia set ½d to 20/-. Lightly mounted mint, neatly displayed on 2 album leaves CAT £250. OR UK SIGNED FOR AT £2.20. 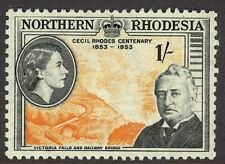 Northern Rhodesia 1953 QEII Complete set SG 61-74 Mnh. 1953 QEII Complete set. Northern Rhodesia. Fine unmounted mint. 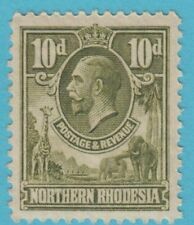 Northern Rhodesia 1925 George V Complete set SG 1-17 Mint. Northern Rhodesia. 1925 George V Complete set. Fresh mint set. 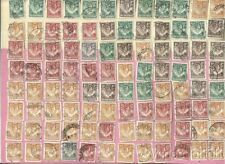 SG 16 (Sc 16) MINT Never Hinged Cat value £120 Green and black Fresh example. Deep colours. When you buy more than one item from us at the same time we combine postage and packing charges. All packages are water-proof fully insured. 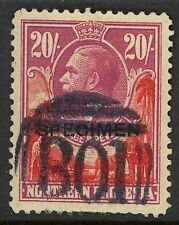 Northern Rhodesia 1938 KGVI 20s carmine-red & rose-purple VFU. SG 45. Sc 45. Northern Rhodesia 1938 KGVI 20s carmine-red & rose-purple very fine used. Gibbons # 45. Scott # 45. 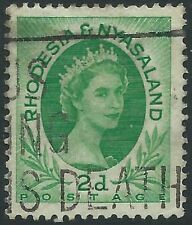 Northern Rhodesia 1953 QEII set complete very fine used. SG 61-74. Sc 61-74. Northern Rhodesia 1953 QEII set complete very fine used. Gibbons # 61-74. Scott # 61-74. NORTHER RHODESIA SG48-49, COMPLETE SET, NH MINT. Cat £100. RSW. NORTHERN RHODESIA QEII 1953 Complete Set of 14 Values Scott 61-74 SG61-74 Mint Never Hinged Catalogue Value £75. VERY FINE & ATTRACTIVE. Save Save Save Save Save Save Save Save Save Save Save Save Save Save Save Save. Northern Rhodesia. Year of issue: 1925. 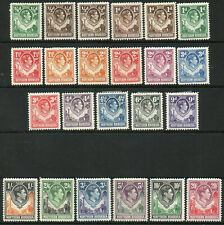 1925 set of 17 SG1-17. Grade: Fine. Occasionally we all make mistakes, and if we do we fix it. Condition: Used. Price: £475.00. Era: King George V (1910-1936). Northern Rhodesia 1925-29 20s. carmine-red & rose-purple, used (SG#17 ). Fiscally used. Short perfs. Northern Rhodesia 1925 short set to 5s SG1/14 fine MVLH/MLH cat £215 - almost all MVLH. MVLH - Mint Very Lightly Hinged - almost invisible signs of having been hinged. MLH/MM (etc) - a mix of MLH and MM with the majority being MLH. This is a Small Lot! SG 14 (Sc 14) MINT Never Hinged Cat value £55.00 Slate-grey and violet When you buy more than one item from us at the same time we combine postage and packing charges. All packages are water-proof fully insured. 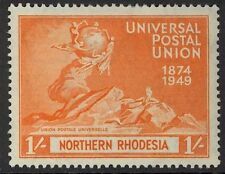 Northern Rhodesia 1953 set SG61/74 fine fresh MNH/MVLH - all MNH apart from a couple which have very light hinge marks (includes 20s). MVLH - Mint Very Lightly Hinged - almost invisible signs of having been hinged. 1925 King George V SG11 2s. Brown & Blue Fine Used NORTHERN RHODESIA.